The MI Band is a high performance heater. Its performance and name are derived from Watlow's exclusive mineral insulation - a material that has much higher thermal conductivity than the mica and hard ceramic insulators used in conventional heaters. A thin layer of the "high" thermal conductive MI material is used to electrically insulate the element wire from the inside diameter of the heater sheath. A thicker, "low" thermal conductivity layer backs up the element wire, directing the heat inward towards the part that is being heated. The result is more efficient heat transfer, a performance solution that lowers element wire temperatures and increases heater life. Watt densities to 230 W/in2 (35.6 W/cm2) available on small diameter nozzle bands. Watt densities to 100 W/in2 (15.5 W/cm2) available on large diameter barrel bands. ​Operating temperatures to 1400F (760C) make it possible to safely melt even the newest resins, like Peek, Teflon, Ultem and Zytel.Higher watt densities than any other band contribute to faster heat-up and throughput to increase productivity. High thermal conductivity of MI and low mass construction give almost instant response to temperature control. This performance solution eliminates thermal lag and temperature overshoot associated with ceramic knuckle heaters. Stainless steel cover as well as side fold design resist contamination by overflow of plastic or other free-flowing materials. Side folds turn to the inside diameter rather than the outside diameter. Permanently attached clamp bars eliminate cumbersome clamping straps, which makes installation easier. Heaters rated at less than 250V ~ (ac) use UL approved lead insulation for operations to 480 ° F (250 ° C) as standard. Lead insulation UL rated for operation to 840 ° F (450 ° C) is available for high temperature application where the leads are shrouded or enclosed with the heater. ASTM Type J or K internal thermocouples are available on lead Type B with loose braid. Expandable heaters are two-piece units with a common top metal that allows the heater to expand open to the full diameter of the barrel. On expandable bands, each half will be one half of the total wattage. Plus, on both expandable and two-piece bands, each half will be rated at full operating voltage, unless otherwise specified. Two fiberglass lead wires exit a single tightly woven metal braid at right angle on the expandable construction versus two sets of leads. Maximum 15 amps at 240~(ac), maximum volts 240. Available as an accessory item that must be used in conjunction with high temperature "quick disconnect" European style plugs. Heavy-duty strain relief is recommended for applications where there is a great stress or continued flexing of the leads. Ceramic covers, with openings for leads, are screwed on to post terminals, providing a convenient, economical insulator. Metallic terminal boxes are available from stock on 3 ½ inches inside diameter x 1½ inches wide (89mm x 38mm) or larger heaters. Two-piece heaters require two boxes. MI Band heaters with holes are available on all widths except one inch wide. Consult your Proheat representative for hole sizes and location restraints. Two fiberglass insulated lead wires rated to 840 ° F (450 ° C) exit a metal braid 180 degrees opposite from gap. 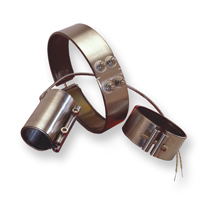 Welded barrel nuts with spring loaded clamping are used during start-up to maintain a tight heater fit on large barrels. This clamping variation is standard for all MI Band heaters that are greater than 14 inches (355mm) in diameter and 1 ½ inches (38mm) or greater in width. An ideal way to provide access for instrumentation is to specify an oversized gap between the heater ends. Low profile barrel nuts are available on all widths. Low profile barrel nuts have a clearance of 0.406 inch (10mm). Low profile clamp bars are available on both one (25mm) and 1½-inch (38mm) wide heaters, for wider widths consult factory. The bars are ¼ inch (6mm) diameter with an 8-32 screw. Hermetically sealed tube construction makes this heater contamination proof and an excellent choice for a longer life in impure environments. Teflon and Zytel are registered trademarks of E.I. du Pont de Nemours & Company. Ultem is a registered trademark of General Electric Corporation. Peek is a registered trademark of Greene, Tweed and Company.